Between late January and early February, authorities said Wenliang Sun bought two weapons as well as a couple hundred rounds of ammunition, authorities said. Wenliang Sun, an international student, will be deported because of an unrelated visa violation. Law enforcement officials in central Florida say they may have thwarted another school tragedy after arresting a 26-year-old international student who bought two rifles and was exhibiting troubling changes in his behavior. 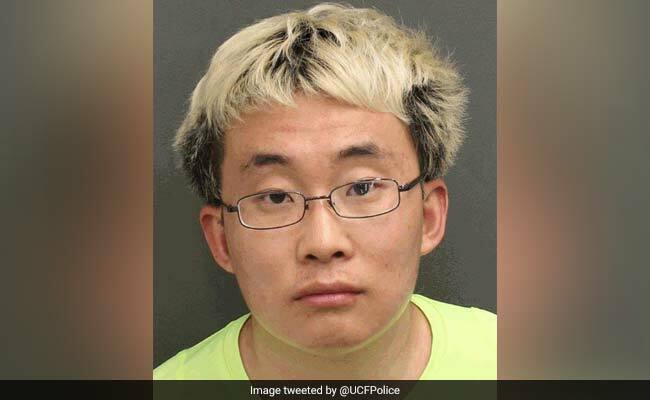 Wenliang Sun, a Chinese national enrolled at the University of Central Florida in Orlando, did not make any threats against the school or other students. But campus Police Chief Richard Beary said that "red flag after red flag" led investigators to believe that Sun could be a danger to himself and to others. Between late January and early February, authorities said Sun bought two weapons - a LWRC 300 Blackout rifle and a .308 Ruger Precision rifle - as well as a couple hundred rounds of ammunition, authorities said. He had also bought a $68,000 Chevy Corvette months earlier, dyed his black hair blond, gained weight, and had been rarely coming out of his room. Beary said the seemingly out-of-the-blue purchases and the changes in appearance shouldn't raise red flags if taken individually. But the pattern, as well as concerns raised by one of Sun's friends, his roommate, and university employees "were very indicative of an individual who's in crisis," Beary said. "If you go back to some of the shooting incidents across the country, we know that people often change their appearance. . . . In my mind, something very bad was going to happen somewhere in central Florida," Beary told reporters at a news conference Thursday. "Again, he bought a very expensive, very fast car. Why? Why would you do that?" When he picked up the firearms, he didn't drive that car. Why? He didn't want people associating him and that car. So I think there was a disaster about to happen, and we stopped it," he said. Sun's emotional and mental state when he bought the weapons is unclear. A university spokeswoman said information about his medical and mental health have been redacted from police reports. But Beary told reporters that based on interviews with Sun, police "were pretty sure that he was dealing with some sort of distress in his life," although he did not say what personal problems Sun may have been facing. "We know that in today's world, a person in distress that owns a high-powered firearm, we just cannot ignore that," Beary said. Sun's Facebook profile picture is a selfie with the phrase, "Shoot selfies, not animals." Yet, Beary said, "he's got a rifle that is supposedly used for hunting. That doesn't make a whole lot of sense." Campus police learned of Sun in late January, when an employee reported him as a "student of concern," according to a heavily redacted police report. Police were again alerted a few days later, when Sun made "some unusual statements" to a counselor. In an interview with police on Feb. 2, Sun admitted that he had recently bought the LWRC 300 Blackout rifle. He said he had never shot it and had locked it in a storage facility, according to another redacted police report. He likes playing with the weapon and looking at it, he told police. A detective offered to keep the weapon for safekeeping, but Sun declined, saying the gun was safe. When asked if he was thinking of harming himself or anyone else, Sun said, "No, never," according to the report. Sun told police that he likes to watch movies, play video games and travel. He said he been in the United States for three years, and he goes home to China to visit his family for a month every year. His parents are well-off financially: His father was a hospital administrator, while his mother was a doctor, Sun told police. He also said the Corvette he bought is considered a "cheap car" in his country. An image of text messages showed that Sun's father had sent him money to buy the car. A friend also told police that Sun had never talked about hurting himself or anyone, but the friend said, "I'm concerned about him." Sun bought the second rifle on Feb. 7, a few days after police interviewed him and raised concerns about his first weapon. Beary, the police chief, said Sun had modified the rifle by adding a bipod and "very, very expensive optics." That same day, a university official tried several times to contact Sun because he had not complied with program requirements to keep his legal status in the country. Authorities said Sun also had not been attending classes - a requirement to keep his student visa. "Despite numerous attempts to try to get ahold of him and explain to him that his status was about to change - he knew the paperwork that he needed to do, he'd been out of the country before - but he wouldn't return any phone calls," Beary told reporters. "Again, another red flag. Something's going on with this individual." Sun was taken into custody by officials with the Homeland Security Investigations and the Bureau of Alcohol, Tobacco, Firearms and Explosives on Feb. 7 for his visa issues and potential violation of federal firearm laws, authorities said. Federal law allows those with nonimmigrant visas to possess a firearm as long as they hold a hunting license, which Sun had. But his possession of the weapons became illegal after his visa violation, authorities said. An immigration judge on March 21 ordered that Sun be sent back to China. Authorities said he will not be allowed to return to the United States for at least 10 years. Police began investigating Sun a few weeks before a gunman killed 17 people at a high school in Parkland, Florida, about 200 miles away. Sun is detained at a facility in Macclenny, Florida, according to the U.S. Immigration and Customs Enforcement's online database. It was not immediately clear who's representing Sun, but investigators have been in touch with his attorney, Beary said.